The Upper Oconee Watershed Network has put out a special call for volunteers who are interested in monitoring water quality in Oconee County as part of the 13th Annual River Rendezvous scheduled for March 27. Jessica Sterling, a board member helping to organize the event, said in a recruitment flier sent out last week that UOWN plans this year to focus on streams in Oconee County that have not previously been investigated or have been monitored infrequently. Included will be Rose Creek and perhaps Little Rose Creek, according to Dave Wenner, another board member and an Oconee County resident. Wenner said Rose Creek has not been included in past Rendezvous monitoring events but he hopes to take advantage of the recent focus on the creek, which flows beneath the wooden, covered Elder Mill Bridge, and start gathering data on the quality of water. Nearly 50 people turned out on March 6 for a cleanup of the area around the bridge, which has been proposed as the centerpiece of a county park. Wenner said he hopes that Barber Creek sites also will be monitored. 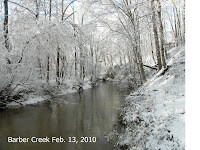 UOWN has some data on Barber Creek from past years and will be able to track changes across time. Volunteers will gather at 9 a.m. on the 27th at the Sandy Creek Nature Center off U.S. 441 just outside the Athens Loop. The session will include training in water sampling and assignment of sites. A light breakfast and coffee also will be included. Volunteers are advised to wear waterproof shoes and dress for the weather. Children accompanied by an adult are welcome. The volunteers, who will head to sites in Clarke and other surrounding counties, will return before noon with their samples. According to Sterling, UOWN will use the water samples to identify polluted streams that require immediate attention and to monitor long-term trends in water quality. Wenner said he hopes to have enough volunteers to gather data from four or five Rose Creek sites and six or seven Barber Creek sites. Portert Creek, Wildcat Creek and Calls Creek are other streams in Oconee County that could be sampled if enough volunteers show up. Often volunteers live along a creek or have a special interest in it, Wenner said. UOWN identifies sites that can be accessed from public rights of way, such as where bridges cross the creeks. Persons interested in volunteering can contact Sterling at jessica.sterling@gmail.com or 706 338 9052 or Wenner at dwenner@uga.edu or 706 769 6036.